Only time time will tell if Casio is right to stick with compact cameras than join the herd chasing mirrorless cameras. Nevertheless I feel that Casio understands my photo taking needs. I regularly see so many people toting DSLRs and mirrorless cameras taking awful photos. I think they will eventually tire of their effort and only a much smaller crowd of photographers who know how to make use of the over spec cameras will remain. In other words the market for mirrorless cameras is a "bubble". I think Casio is smart here. 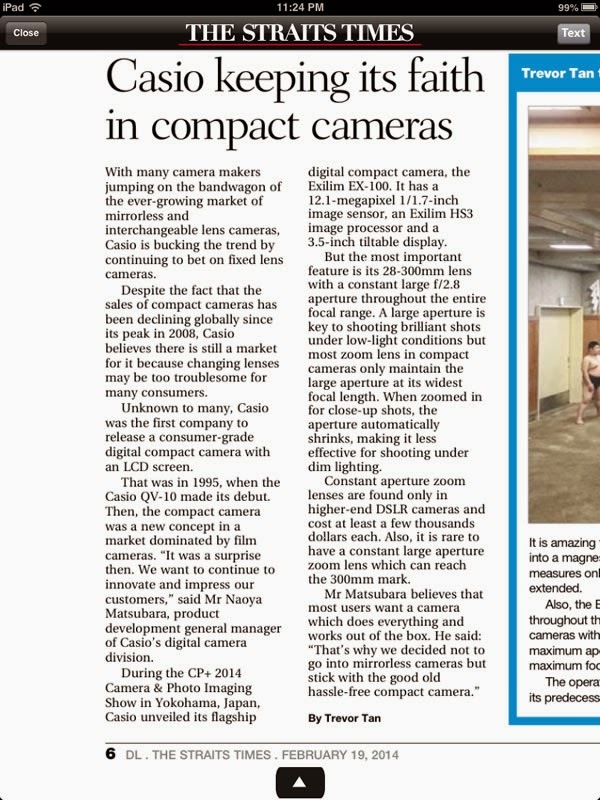 It will take the opportunity to corner the market of compact cameras left behind by the current leaders. Of course Canon, Nikon etc., will not completely leave this segment but their neglect will become obvious with lousy offerings which customers eventually avoid buying. If they stick to this market they will end up selling on price and leave all the innovation opportunities to Casio. My next camera could be a Casio. The Exilim EX-100 has a constant f/2.8 throughout the entire focal range? I like that and can really do nice things with that feature. I'm afraid Casio will go down the same road as Yashica (remember them) and Kodak by sticking to just compact cameras, and ignoring the MFT segment. Why spend money on a compact when a smartphone can do the same (or even better) job? Casio's strategy will end up like Olivetti, ie, making the world's most technologically advanced typewriter. A statue in Batam to honor terrorists? Peh Shing Huei: When the Party Ends. Istana CNY Party: You are "un-invited"
What about $$$ in Medishield Life?